StarTrack has contracted Hino Australia to supply 52 new trucks for deployment within its fleet nationally, consisting of 34 Hino 300 Series and 18 Hino 500 Series models (in both long and short-wheelbase variants). The decision was based on favourable whole-of-life running costs and modern cabin design, the company says. A thorough new-vehicle tender process conducted by StarTrack reviewed fuel efficiency, driveability and whole-of-life costs, and included extensive trials of the Hino 300 and 500 Series truck variants. 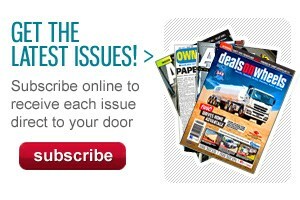 President and Chief Operating Officer of Hino Australia, Steve Lotter, says that whole-of-life vehicle costs are an increasingly important factor for new truck buyers in Australia. "StarTrack's tender process is very extensive and thorough, so to be selected at the end of it says a lot about the strength of Hino trucks in the market," he says. "With a projected fleet lifespan of five years or more, we feel Hino's renowned durability and reliability will be particularly beneficial to the efficiency of StarTrack's operation. "At Hino we know that our trucks present favourably to drivers, but it's the cost of ownership that must be minimised to prevent businesses looking elsewhere." 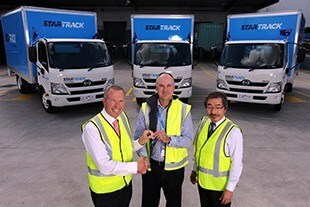 StarTrack Director of Operations, Richard Conron, pictured with CMU Group (CMI Melbourne) Joint Managing Director, Paul Crawford, and Hino Australia CEO, Ken Sekine, says the well-designed cabins of Hino trucks were a contributing factor in its choice of 300 and 500 Series models. "Feedback from our field trials indicated that the Hino cabin designs are more modern than those of their competitors," he says. "The inclusion of the integrated multimedia screen, plus the excellent all-round visibility from the driver's seat, are advantages over other trucks on the market." StarTrack's 300 Series Hinos will be used in its 'run' truck fleet, which consists of pantech-walled trucks used predominantly for loose carton freight. The 500 Series Hinos will join its 'bulk' truck fleet, which is made up of both pantech and curtain-walled trucks used mostly for palletised freight. 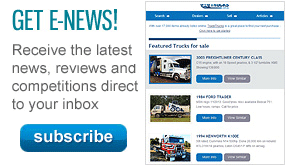 The new Hinos join a fleet of more than 3000 StarTrack pick-up and delivery vehicles nationwide.